Tomorrow we fly, so tonight’s supper sees us relying on takeaway food. Because today is a holiday (Good Friday), nearly everything is closed, or at least closed early. The fish came from a shop that closed up at 1, and by the time we got there, the ones we got were two of the last four they had. We had a lunch of fried snapper earlier in the week, but the other time they were served with fried banana pancakes. That’s right, not fish ‘n chips, but chips ‘n pancakes. Apparently, this is the 'standard' traditional mode. It’s been too short a time here, but despite that, we managed to sample a lot of the island’s foods. Some were better than others – and really, if I always ate this much fried food, I’d weigh a lot more than I do, and have higher cholesterol too. Still, those are the sorts of things that happen when you travel and move away from the comfort zones of what you might be eating if you were at home. It’s all about the new experience – and not just the food but the culture in all its richness. 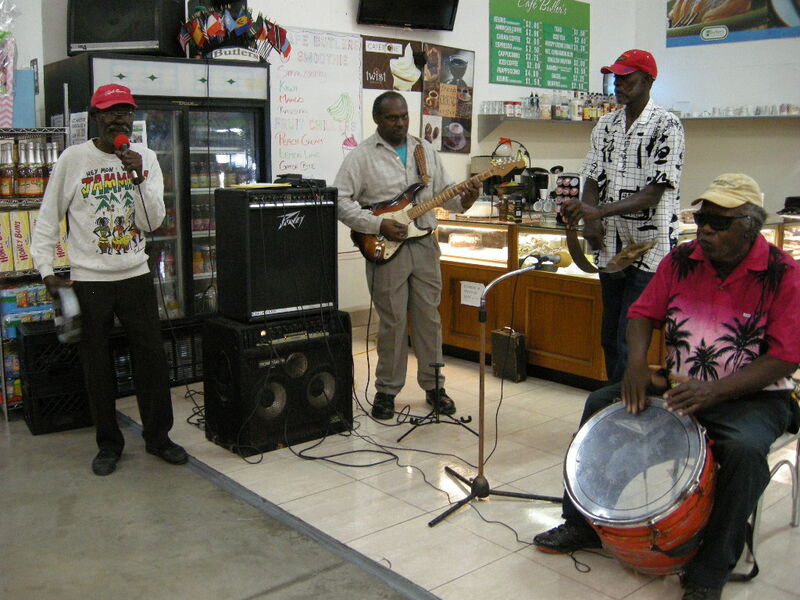 Heck, where but here have I ever seen a band playing while I shopped in the supermarket! I can’t wait to see where our next adventures in eating might take us. Hopefully, someplace as charming and friendly as the Bahamas were. But for now, it's time for home. So all I can say is ‘Chow’. 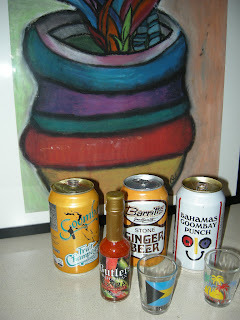 So instead, you get a photo sampling of the some of the sweet (and I mean SWEEEET) drinks here. For balance, there’s a bottle of spicy hot sauce in there too. It’s every bit as hot as the fruity drinks are sugary. The sweet fruity theme carries into many of the cocktails here as well, such as the ‘Bahama Mama’, a concoction of sweet punch with more than one kind of Bahamian rum. Too many sips of those and you’d soon be needing a pair of Bahama Pajamas. Here’s a link to a range of typical Bahamian foods, including the strangest (to me, at least), macaroni and cheese. All I can think is that it must have been a ‘gift’ from some well-intentioned missionary, as there are certainly no macaroni trees here. Other items on the menu included conch (of course) as well as rice ‘n peas. These were similar to other Caribbean versions of rice ‘n beans (and yes, the ‘peas’ in the Bahamian dish are indeed beans), but the version we tried lacked the coconutty taste of versions we’ve had in Costa Rica or Belize. But that vaguely ‘Rice-a-Roni’ flavour may just be the Bahamian twist on this particular staple – or else thanks to the chef whose cooking we were sampling. Desserts were tiny rum cakes. Yes, the scent and flavour of rum is everywhere. Almost as ubiquitous as Kalik, the local beer (origin of that name is a whole other story in itself). Cheers! Grand Bahama is small enough that it’s easy to explore the whole island, especially when your rental car is a fuel-sipping hybrid. Where Monday was a day for exploring the east coast, today’s drive took us to the west end. It was sad to see the many abandoned buildings, as we'd hoped to contribute to the local economy... but luck was with us, as we met up with some fishermen just returning to shore with their catch. 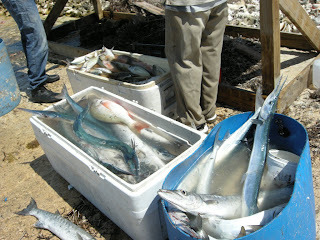 We laughed with the throng of local women who also showed up for fresh fish. And really, the catch couldn’t have been any fresher – so fresh that one jumped out and onto the ground! These fish were still kicking in the proverbial bucket of iced water, so the only way they could have been fresher would have been if we'd been along on the boat with the men. We knew that snapper (top of the heap, centre) was readily available on most restaurant menus, so instead chose ourselves a bonefish. In the photo, the bonefish is the tubular fish that looks almost transparent. The one that looks like a small cousin to the swordfish is the needle nose, a fish that often accompanied us when we swam in the sea. 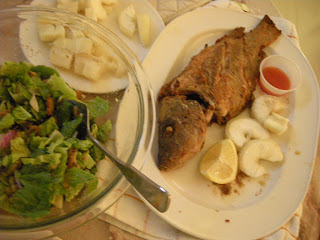 Although the little kitchen in our condo is reasonably equipped, we didn’t feel confident about cleaning fish there, not only for the lack of good knives, but for the clean-up it would have meant (after all, this is a holiday). Luckily, the nice man not only gutted the fish, but cut it into beautiful fillets for us. We asked the local women who were 'shopping' with us how to cook it, and we followed their instructions as carefully we could, baking it with onion and green and red pepper and lots of freshly squeezed lime juice. As accompaniment, I'd baked a couple of yams in the oven. 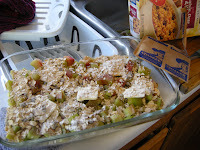 Even though I’d popped their skins, they still oozed onto the bottom of the oven. So, despite best efforts, here I was going to have to clean the oven after all. Nothing better to remind me of home sweet home. 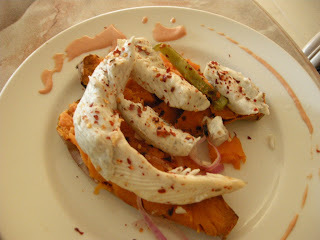 We had a bit of leftover dipping sauce from some conch fritters we'd had earlier, so the D.M. drizzled that around the edges of the plate, to give it that ‘French’ look. Another yummy supper in our island paradise. When we travel, we often have restaurant meals for lunch, rather than supper. For one thing, the prices are usually easier on the pocketbook. Many restaurants are also less crowded at midday. So tonight’s supper was kind of a compromise – at a restaurant, but at a ‘budget-style’ place we’d heard served excellent conch. We had two kinds of conch (sounds like 'conk'), plus a heap of chips. I ordered the conch burger and the Dear Man ordered the crack conch. 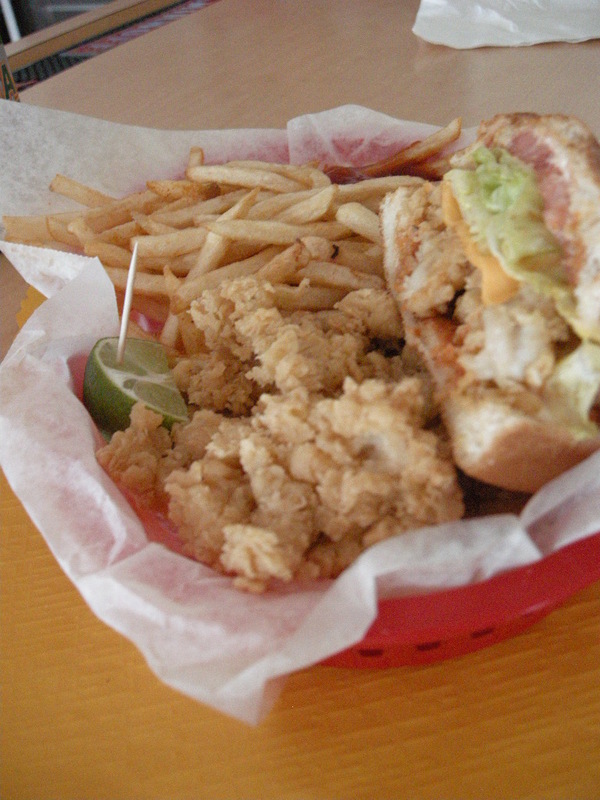 We divvied up the burger and conch bits so we both got to try each. Conch is the one food you can’t avoid on the Bahamas. Nor, would you want to – they know how to prepare it here. 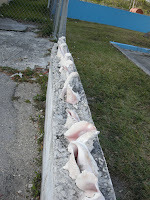 Although conch meat is naturally quite tough, the Bahamians have learned ways to tenderize it. You can often hear terrific pounding in the kitchen, as that’s one of the ways of softening it up. The other way is with lots of lime juice, freshly squeezed, of course. That's how conch salad works, a deliciously refreshing treat, basically a kind of ceviche. Flavour-wise, conch is vaguely related to clam (our west coast geoduck is a taste that comes to mind), somewhat sweet and with a bit of chew to it. But the conch isn’t only used for food. 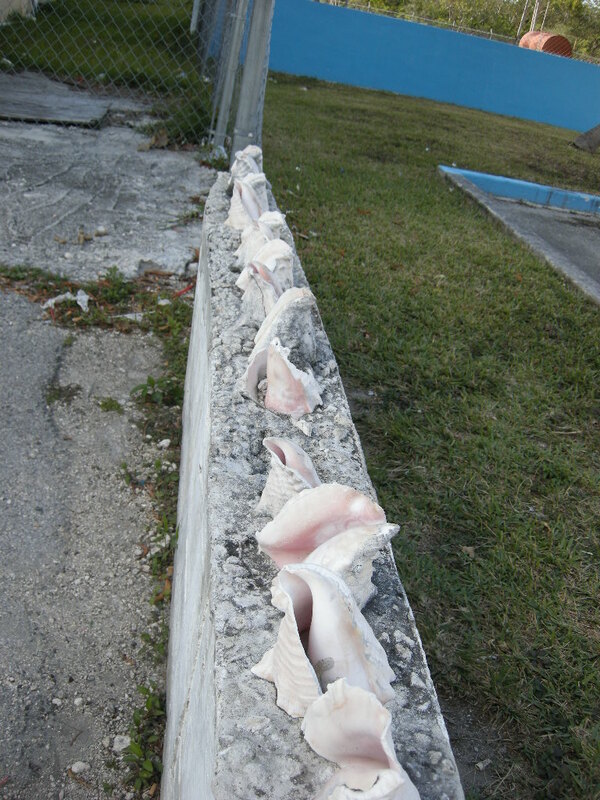 Its beautiful shell shows up everywhere, as garden or patio decorations and even embedded in cement as part of a fence. Exploring the eastern end of Grand Bahama led us to a lobster fisherman. As is so often the case, we weren't even looking for seafood. It just seemed to find us. The tails he sold us were frozen, but they cooked up wonderfully in our little condo kitchen. And we got waaaay more lobster than if we'd ordered in any restaurant. A limited assortment of cookpots and spices led to some interesting challenges, but hey -- that's nothing new. 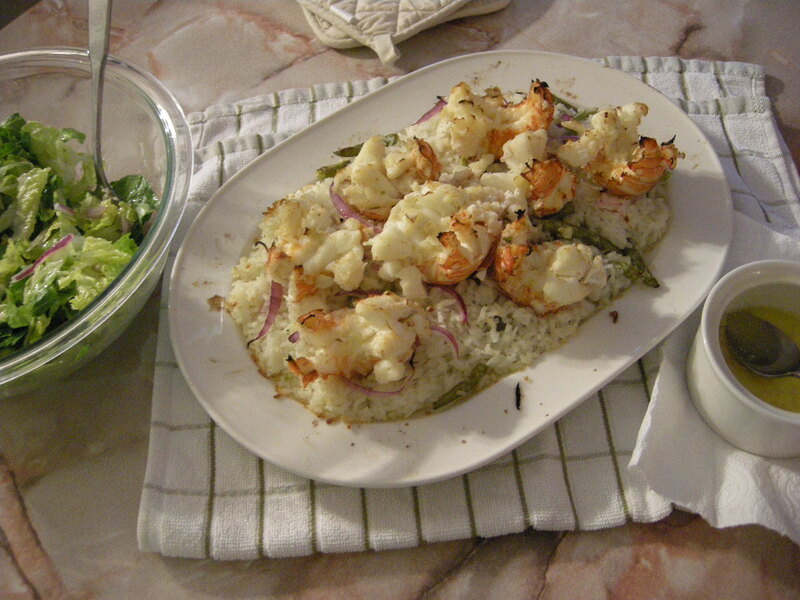 I whipped up some coconut rice while the lobster tails steamed on the stovetop. Laying the tails over top of the rice was more one of fair distribution than aesthetics, as each little darlin' needed his equal share of melted garlic butter and fresh-squeezed lemon juice before they went under the broiler for a last-minute hot-up. And yes, that's a tiny bowl (actually the sugar bowl pressed into service for the occasion) of still more melted butter with bits of fresh garlic. Plenty of garlic and lemon in the salad too. Breath mints all around! 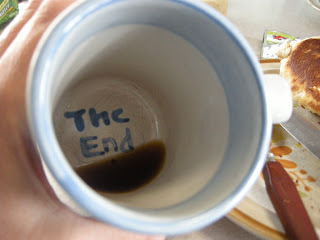 That's what the message at the bottom of my cup says. 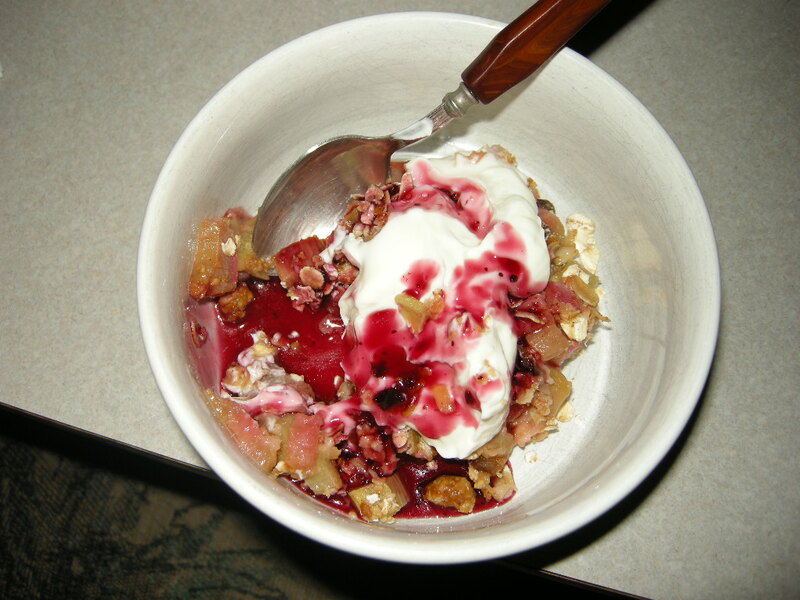 But I said I'd tell about how I made the rhubarb crisp, so I won't go back on my word. 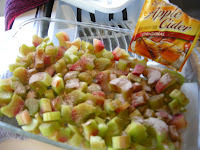 especially where the fruit in question was rhubarb. 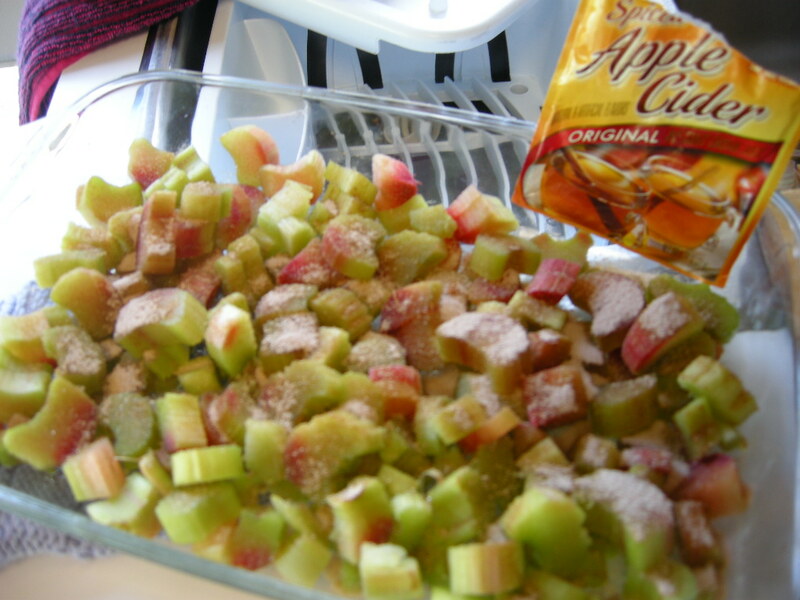 I used a packet of pre-sweetened apple cider mix, a drink that's supposed to be mixed with boiling water. It even had some cinnamony flavouring in it, so it worked well. some dollops of butter (no margarine tagline will ever convince me not to use butter). It turned out to still be a pretty tart dessert, so we topped it with vanilla yogourt and then really zipped it up with a swirl of huckleberry syrup we'd bought at a touristical spot along the way. And because last time I said that this blog was ending it turned out that I was lying, well, all I can say is that it's ending for now. There's still a drop of morning coffee in my favourite cup, so who knows? In the meanwhile, the big limb will still carry on. And rememember, don't be stumped when somebody asks, "What's fer supper?" Use what you have on hand and don't be afraid to mix things up and substitute -- even if the ingredients may initially seem strange. In truth, now and then, the meal might not be so great. Supper happens. But sometimes you'll find you've come up with something remarkable.